On this web page, I spoke about the fact that I had become interested in this event during my struggle to get the medical care I needed throughout my residency for my cancer diagnosis. I heard that people from my department were reading it today. Some stated I was very brave, others, well, others do not appreciate such outspokenness. I was even told by some not to participate in the solidarity event. What are they afraid of? I speak out because I dream of a future where medical students and residents can live without fear of bullying, harassment, and retaliation. I want doctors to be able to care for themselves as well as others. My program had been punishing me and accusing me of being “unprofessional” for attending appointments despite my informing them in advance and providing doctor’s notes. On the web page launched today, I stated it was also very difficult for us to get mental health treatment. During my research into why this was the case, I found many examples of other residents who have experienced negative consequences after revealing their need for mental health services. It upset me that stigma is so prevalent in this field. Everyone needs help sometimes, and doctors can get sick too. I am not sure how many people are aware of the obstacles physicians face when striving to care for themselves physically and mentally. Once the issue is recognized, we can do something to stop it. Standing up to this is going to be extremely tough. When I began standing up for my basic human right to lifesaving medical care, I was repeatedly retaliated against. This retaliation occurred even after I pointed out the fact that my doctor stated had I not received the treatment they punished me for, I would not likely be alive today. That fact did not appear to register with my superiors. I then went to the dean’s office, then to the ombudsman, then to the institution’s president. It was a game of hot potato. It was a problem passed around the institution so fast that no one held on long enough to burn their hands. It was as if they thought that, if they ignored me, I would simply go away. I decided to go outside of the institution. That surely got their attention as not even a month after going to the government I received an email from my institution stating there was a vote for my termination. At least they stopped ignoring me. I had documentation of what I had been through since my diagnosis and proof that my performance was at or above average. Despite major surgery, tubes, drains, fainting, constant vomiting, and panic attacks I was still able to be a good doctor. I always put the safety of my patients first, and I don’t think there is anyone in this world who can contest that, not even those who voted for my termination. I was both a doctor and a patient and despite pressure from above I received excellent evaluations from my attendings. So how on earth did they have justification to fire me? I had hoped that the dean’s office would look at the facts. Apparently, they didn’t. They chose to officially terminate my employment right after the National Day of Solidarity to Prevent Physician Suicide volunteer web page went live. I am not sure what to do at this point. Next week I am scheduled to have an MRI, and I do not know if I will have a paycheck or even health insurance to cover it. I know you have helped so many other physicians, and you are truly an inspiration to me. I hope all that I have been through will jumpstart a change in the current medical culture. I want future physicians to not be forced to choose between being a doctor or a patient. Outraged that a hospital would fire a doctor for having cancer? Appalled that a hospital would fire a psychiatric resident for helping suicidal physicians? Show your support by attending a vigil. 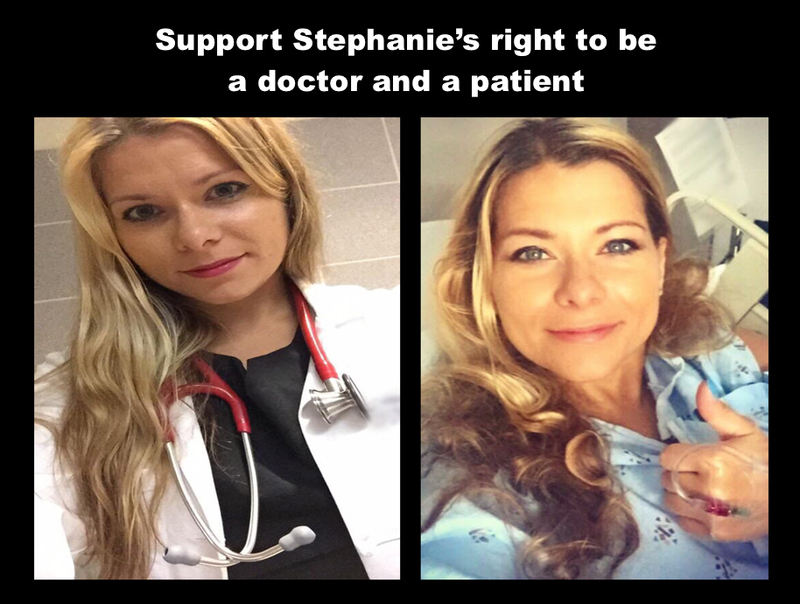 Stephanie Waggel is a psychiatrist and can be reached at Improve Medical Culture. Pamela Wible pioneered the community-designed ideal medical clinic and blogs at Ideal Medical Care. She is the author of Physician Suicide Letters — Answered and Pet Goats and Pap Smears. Watch her TEDx talk, How to Get Naked with Your Doctor. She hosts the physician retreat, Live Your Dream, to help her colleagues heal from grief and reclaim their lives and careers.